I feel as if I have been living in an Impressionist painting this summer. There is a mysterious light which tries to envelop us almost as if we are caught in twilight, daylight never quite breaks through. Everything has taken on a slightly misty, blurry look. With all of the cold and rain we have had in Spring and now Summer, flowers here were slow to bloom and then when the days of sun came they burst into bloom all at once, as if they knew that summer days would not come this year and they had to make the most of those few moments of fame. They are now battered by the weather and insects, also desperate to grasp life. Gardens are faded, petals and leaves scattered across pavements and on lawns. I love the way that nature usually prepares us for the splendor of summer by gradually building up to the ripening of blooms, colours, scents and tastes over a period of a few weeks and then it is there in all it's glory for a short time to overwhelm our senses. That did not happen this year. This year instead of gentle awakening towards deep rich colours and scents the scent we have had is of water, and the colours are a blur of what they were intended to be. An odd mix of pale, muted and very dark and dusky, all at once. Cats relish the days they get in gardens, to roll in the sunshine and hunt bugs in the grass. 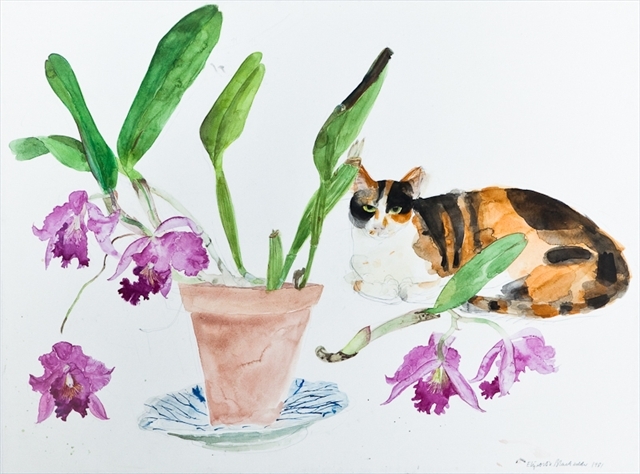 As if I am wandering in an Elizabeth Blackadder painting, cats arrange themselves decoratively about me on my walks matching the gardens in which they chose to play and sleep. This wonderful orange and white tabby did not want to be disturbed. Our gardens were planted many years before we lived here. We thought about taking out the plants and putting in colours we preferred, but the hot jewel like quality of what is here has enchanted us, and they stay. Peonies were gone in little more than a day, petals strewn in the tall rain soaked grass. The rose buds either never opened, or if they did their heads bent down heavy with rain. The huge blooms of the several Clematis have been nibbled this year by the falling rain, and yet there is still something majestic and other worldly about them. Two more cats in their very own Elizabeth Blackadder landscapes. It has not been a vintage summer, and yet nature has given us it's own version of decadence and faded glamour. Gardens are not as beautiful this year as last, and yet .... there is a kind of melancholy there, a little regret lingers, love unrequited, or lost. Opportunities missed. There are no Hoverflies, few Bees, Butterflies are rare and the seed heads have come early this season. Swifts, Swallows and House Martins will leave soon. 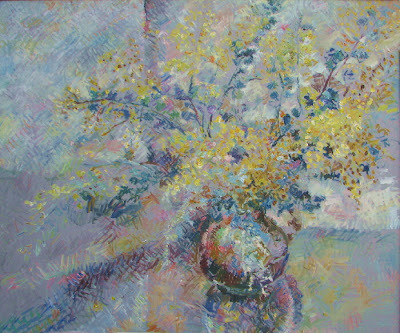 I love the way that Dame Elizabeth portrays flowers in a natural state, nature untouched, only slightly tamed. The randomness of her flowers fits perfectly with her cats who glide in and out of her paintings effortlessly. Cats and wild gardens go together. 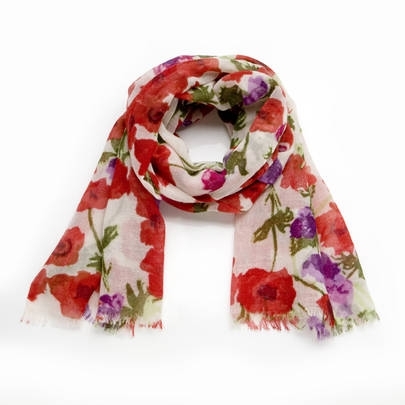 I also love this scarf which combines scarlet and purple. A colour combination that works so well in nature but is rarely used by humans. It's wool - but then this is a cold summer! A bio about him says this, and I agree, he is a master of light. "Pir Tareen has a masterly touch in portraying the emotive power of light, colour and shade as shown in this work, part of his "Brisbane Summer" exhibition at Dabbles on Days Gallery, Grange. "I am a simple perfectionist... my main concerns are light, colour and shade" You don’t have to speak Italian to understand what Italy’s leading Art Critic meant when he described a Pir Tareen painting as “una pittura luminosa”. " A lot of lovely pictures and you are right. We haven't had any spring this year, it's been cold and rainy. Our spring mirrored yours, and the start to summer has been cool and wet. Roses bloomed and had their petals blown off almost immediately. I long for heat and sun - the sort that makes one's hair feel warm on the top of the head - the sort that calls for sunhats and sun glasses. It's promised, but I am dubious. Wiltshire seems quite far from Derbyshire and Shropshire, where I'll be in September....another time, perhaps. What a lovely post especially your decriptions of the effects of this disappointing summer both for the plants and us humans. After such a beautiful sunny day yesterday my garden looks quite forlorn once again in this rain and I'm sure the rain soaked birds are veryconfused! It is terrible isn't it? Fingers crossed we get some sun next month! Thanks for joining my blog and I am glad I have found yours. I'm now your latest follower. I love the idea of living in an impressionist painting and the field of flax could have almost been one. The rain has certainly given the countryside a lush and painterly look. I love that no two gardens are ever the same ~ and no two seasons either. Lovely post! I am off to learn more about Pir Tareen. Thank you Zusu! I love the English eccentric gardens too, everyone shows their own talent and loves. Living in a painting is right - I always feel that living in England. Such a gorgeous place to live! Your photos capture it well. What a gorgeous set of photos! When I first came to live in London in 2007, I was astounded by the multiple shades of green that I could see. I wondered over the next 5 years what happened as the countryside didn't seem so green in later years. Well now I know - it is the rain. 2007 was particularly wet and so is 2012. I find it so beautiful but wouldn't mind complaining about a hot and sticky summer next year! PLACES ~ Beside The Sea!